When it comes to sleepwear, I'll admit it: Until recently, I had kind of "let myself go." See, I'm perfectly happy sleeping in a t-shirt and sweatpants--not that there's anything wrong with that. But over the years (yes, years), my go-to rotation of sweats has gotten old, stretched out, and even less-cute than when I started wearing them. (And let's face it: They weren't that cute to begin with.) I am well aware that I have an ugly-pj habit, but I've been reluctant to quit it, because they're just so darn comfy. Enter Bare Necessities to save me from myself. They recently challenged me to find sleepwear that's just as comfy as my old standbys, but infinitely cuter and more flattering. So I went on a mission! I started searching and trying on a bunch of different pjs, robes, and loungewear sets. And now...I feel like a convert! All of the styles shown above are just as comfortable and easy as my old faithfuls, but so much better looking. This is a big deal for me, since I often work at home, so my sleepwear regularly goes into overtime and becomes daywear (don't judge!). I now know that I'd much rather spend the morning in a flowy cardigan than ratty sweats. So, if your sleepwear wardrobe is lacking like mine was, consider giving it an upgrade. And since we're entering holiday season, now's the perfect time to treat yo'self. Nice, new pjs will look better and you'll feel better in them, too. -PJ Harlow blush-pink loungewear set - I love the cardigan for lounging around the house (honestly, though, it's cute and substantial enough to wear outside); the silky pants and tank are great for sleeping. -Lauren Ralph Lauren Plaid Flannel Pajama Set: The colors of the plaid are gorgeous, and the fit is amazing. I actually went a size down in this one, because I loved the way they looked a little more fitted. I also liked that the fabric felt a little lighter, thinner, and crisper; it's not super heavy flannel. And these Ugg slippers are one of my favorite things out of everything I'm wearing in these photos. They're lined with sheepskin, so they're super cozy, but they have enough structure that you could even wear them to run outside to grab the mail or something. -PJ Salvage Ski School Flannel Pajama Set: Thick, supercozy flannel that's perfect for supercold winter nights. And I love the retro ski print! 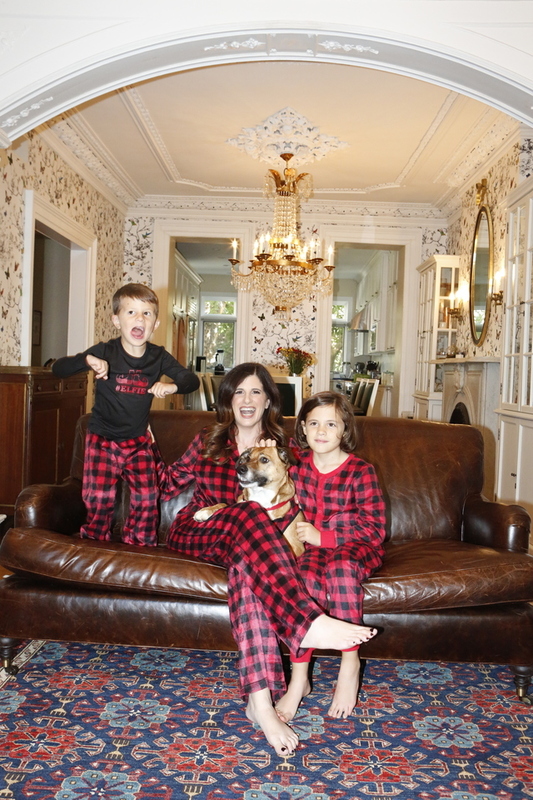 -Karen Neuberger Buffalo Plaid Family Pajamas: While we're at it, holiday is also the perfect time to wear matching family pajamas. I mean, how cute are they?? My kids and I were obsessed with them, my dog had mixed feelings (! ), and my husband refused to join in on the fun (well, at least for the blog photos!). You can find my two-piece pj set here, my son's unisex "#Elfie" pj set here, my daughter's unisex onesie here, and my dog Easton's outfit here! 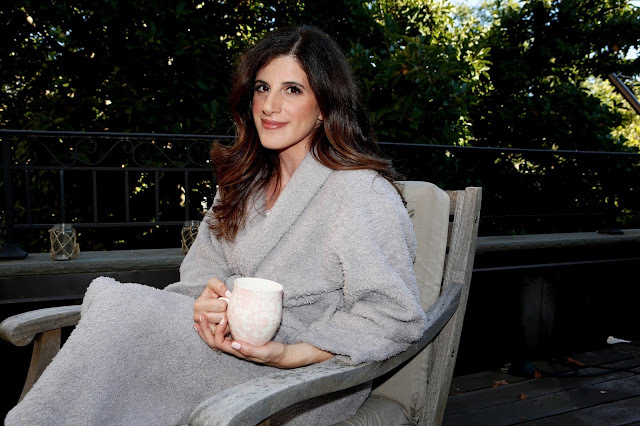 And finally, to start your updated sleepwear wardrobe off right, I've partnered with Bare Necessities to give away this Barefoot Dreams Cozychic Robe like I'm wearing in the last photo above. I've actually owned one of these robes for going on ten years and I can attest that they are THE BEST. So soft, so comfy--since Barefoot Dreams also makes super cushy blankets out of the same material, these robes are literally like wrapping yourself in a cozy blanket. What's better than that? Thank you to Bare Necessities for upgrading my sleepwear game--and partnering with me on this post! That robe is to die for! 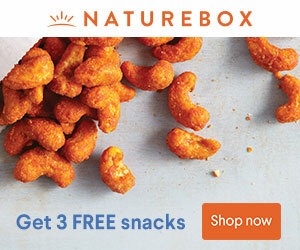 Perfect for curling up this winter! I am a big fan of an oversize tshirt and a sweat pants but sometimes I do like to put something a bit more fun when we are sleeping away or people are sleeping over. I liked the classic button down Plaid Fleece Pajama Set. Love the warm wishes plaid set! so cute. I definitely need to step up the pajama game! I like the Plaid Fleece Pajama Set. The Kids Unisex Plaid Fleece Pajama Set is my favorite. I like Karen Neuburger Warm Wishes Plaid Fleece Pajama Set. Plaid Fleece Pajama Set. I never really think about myself when shopping for PJ's. The Unisex Plaid Fleece Onesie is just my style! Love the classic plaid pjs !! I need to get time some asap ! These pajamas are too perfect! You all look so cozy in your new pj's! Perfect time to get some matching holiday photos. The well wishes set is my favorite! I absolutely love this robe! Thank you! I like the Karen Neuburger Men's Buffalo Plaid Fleece Pajama Set the best. I bet you had an old IU or AGD shirt in that old sleepwear. Love those red plaid matching PJ's! They look so cozy and comfy! Warm Wishes Plaid Fleece Pajama Set is my favorite. They are all adorable, but the plaid fleece unisex onesie is my absolute favorite - so cute! Karen Neuburger is my favorite. Love that they have holiday designs for the whole family. All are awesome but the WARM WISHES PLAID FLEECE PAJAMA SET is my favorite, thanks! I like the PLUS SIZE PLAID FLEECE PAJAMA SET. Love the onsie..but don't want to undress for powder room visits..so the ladies PJ's in fleece. I love the plaid fleece set of pajamas! So cute! The warm wishes plaid fleece pajama set is so cute! I love the plaid fleece pajama set!! Warm Wishes Plaid Fleece Pajama Set rocks! I love all their items but I would love to have the plaid fleece pj set, looks so warm and cozy. My favorite is the women's KAREN NEUBURGER Plaid Fleece Pajama Set. I love THE KAREN NEUBURGER KIDS UNISEX PLAID FLEECE PAJAMA SET. Thanks for the chance to win such an amazing giveaway. The plaid fleece pajama sets for the family are adorable!